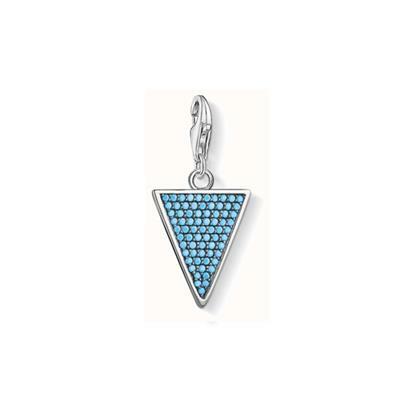 From Thomas Sabo Charm Club is this Turquoise Triangle Charm. A stunning addition to any Thomas Sabo charm bracelet. This charm adds a personal touch to a gift for her. This Thomas Sabo Turquoise Triangle Charm features a triangle design with Turquoise coloured Cubic Zirconias inside of the symbol. These stones give the charm an extra sparkle and makes it stand out on your Thomas Sabo charm bracelet. This charm is crafted from 925 Sterling Silver and Turquoise Cubic Zirconia stones.